Horizon: Zero Dawn, Zelda: Breath of The Wild, Nintendo Switch, Torment: Tides of Numenera, Open World Games, Your Emails and More! This week Shawn, Julian, Elysium and David Heron go deep on a ton of cool games and talk about open world game design. I've never played a Zelda game before this week, but Breath of the Wild has its hooks in me deep. Almost everything about it hits me just right. Open world games have been my favorite genre since Escape Velocity on the an ancient MacBook (it ran os 7, if you cared) I got on eBay. Before that I'd never played a game where you go anywhere, do anything, in whatever order you want, for as long as you want. Some people don't like games where you have to "make your own fun." In my experience there's no other way to have fun. Too good to keep hidden in the Horizon Zero Dawn thread. 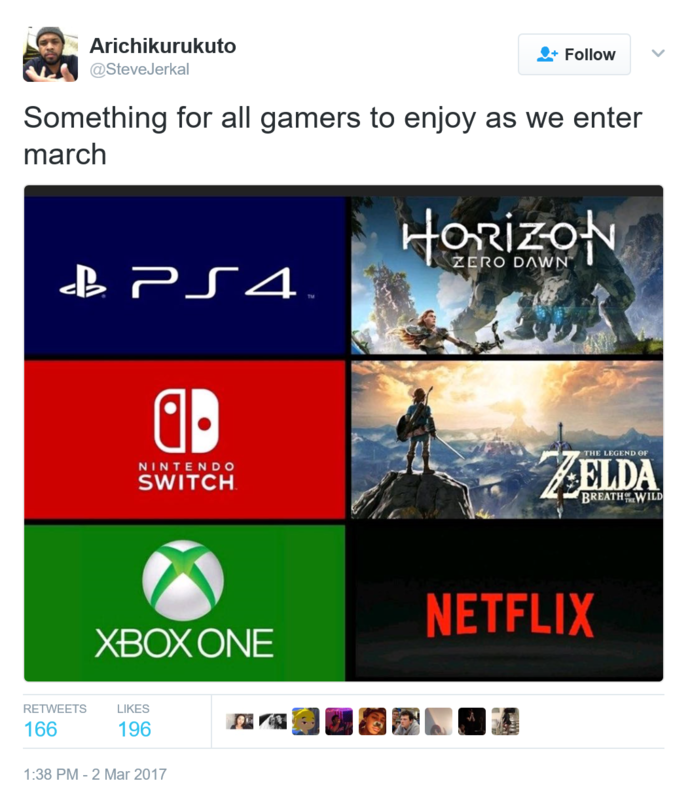 They should have touted Twitch, so you can watch people playing Zero Dawn and Zelda. Oh damn you guys. This is the exact topic my buddy and I are going to record tonight and now it feels like Simpsons Did It. What really interested me about the open world of Zelda breath of the wild, was how they captured in nature in it. I feel that can be a lot harder to do than towns and cities. What, and have the whole game spoiled for them? No way, I'm avoiding all Twitch streams of Zelda and Zero Dawn like the plague. Definitely recomend going into blackout mode if you're interested in playing Zelda. People often say no spoilers, and only mean plot related stuff, but honestly I think this Zelda works best as a vehicle for discovery of everything. It's best if you don't know even the mechanics or anything else. Hey, less than a week on GWJ and I get a question in the email section (the "best vs favorite" one)! This is one of those “throw a bone to the new guy“ things, isn't it? I really enjoyed this discussion. Thanks for asking it! I think in comparing video games to other media like movies its just a mater of time. We might not be talking about video games the same because the media is still too new. You can make a lot of the same comparisons though. For example, some of the movies I consider "the best I've seen" are silent films like Tolerance and Metropolis. And when you compare them to modern movies the technology is very different (they didn't even have sound), but the elements of the art that they could control with the technology of the time still holds up. The set designs in Tolerance and a lot the special effects in Metropolis are still impressive and these movies still convey strong emotion to a modern audience. In the same way the gameplay of Super Mario 3 or the music of Guardian Legend or the pixel art (and music) of Final Fantasy 6 still hold up today (having just played FF6 for the first time a couple years ago I can say this is true for me). I think the more we look back at the "best" video games of all time there will be standouts despite whatever technology was available at the time they were made. And as time goes on there will be more best vs favorite discussions. The original Star Trek is my favorite series of the franchise, but Deep Space Nine is the best series of the franchise. Thanks! I will say the one game that seems to transcend the best/favorite line is Half Life 2. I really dislike that game. *ducks* But I understand its place in the Pantheon. I think one of the things that's related to games' relative newness is that most people (including me) don't have a working knowledge of how games get made, at a technical level. Like, everyone knows what a movie director does, but I have no real idea what a game director does. Most people know what a cinematographer does, or how editing works, but don't know the first thing about physics engines or - more importantly - what it takes to adapt one into something that's actually compelling to play. I thought David made a good point about the dangers of creating a canon. The movies, books, etc that have gotten labeled "Best" got that way through a process of academic rigor and privileged gatekeeping. I'm a selfish gamer ... I want all the moments aimed at me....[In open world games] it's on you to get the game to care about you. ... [I want to feel like] me and the game are on the same team. By that definition, it really seems that EU4 is an open world game. From my limited experience it is on you to get the game to care about you. I never felt that EU4 and I were on the same team. It was a game where you had to make your own fun. I do think open world games are less [aimed towards the player]. The guys come in and throw a bunch of cards up in the air and say "Have a good time buddy." Have you seen the list of EU4 DLC? Where do you even start? That's it - EU4 is an open world game. Great episode and open-world discussion, Zelda and Horizon are awesome games. Open world games have their problems and I can usually see where people are coming from but I do find it puzzling when critics call out the collectables or the optional objectives as negatives. The point, and strength, of open world games is that you do what you want to do when or if you want to do them. If you aren't interested in collectables, don't collect them. If you just want to do the main quests and would rather ignore shallow side quests then do that. Other people who play the game will want to do those things. It's a bit like going into a restaurant and criticising the menu for listing too many things that you don't want to eat. Why both having things like 'pasta' and 'salad' on the menu when all you want to order is pizza. The restaurant owners could save so much time and trouble, and you a lot of reading, if they just did pizza and dropped all other options. Of course a percentage of their customers, who wanted other types of meal, or who liked to eat different things depending on the mood they were in, would then be forced to go elsewhere. And if you're SallyNasty you go for the exotic people-killing heart-attack-platter challenges so that you can unlock an achieve-er, I mean get your name up on the board. I'd say it's more like walking into a restaurant and seeing a bunch of stale bread sticks floating in mid-air all over the place. The chef promises you a tote bag if you collect all of them. Meanwhile, your meal is getting cold. The more I play Zelda the more I appreciate the minimalist way it's doing open world stuff. No giant, glowing markers (other than the towers). Even their open world collectibles are just simple little environmental puzzles that you wouldn't even notice if you weren't paying attention. Something that feels a bit more clever and a bit less like busy work to help you grind away hours of your life is appreciated. I'd say it's more of a buffet style restaurant. You paid your fee to get in, and you get to have your pick of anything in the steamer trays. You will feel like you've gotten value for your dollar if you like a little bit of everything, but also if you just ate chicken wings until you got sick. What gets to me is talking about optional quests or optional side activities as if the player is being forced to do them (I've seen the icon filled maps of games like Skyrim shown with the question 'Who has time for all this!?' when the simple answer is: You don't have to do all those things. Just do what you want to do). If there is a lot of mandatory, boring and/or repetitive content that you are forced to do to progress in the game then that fits your analogy (Far Cry can be guilty of that) but if the side content, no matter how mindless, is optional then you can effectively walk past all the floating bread sticks and just go straight to your meal. Hopefully, Zelda and Horizon: Zero Dawn are the start of a step up in the general quality of open world games. Less heavy handed guidance would be good. Thinking about it, that's a very good analogy. Linear games are like regular restaurants where you get a more refined experience but, potentially, restricted in choice where as open world games are like a buffet style restaurant with lots of choice and the potential to eat as much or as little as you like but, because so much food has to be made available all at once, the over all quality has a tendency to be lower. What struck me the most out of the discussion on the podcast is how Zelda and Horizon have beaten Ubisoft's Ghost Recon at the open world game. In a similar vein to the open world NHL (NFL?) sport game, I believe a producer saw a proof-of-concept GR game from a few years ago and said "Make it open world!" GR is a fun game but one less than the sum of its parts. It's biggest inspiration is clearly MGS V but is, systems-wise, nowhere near as refined. The AI team is useless. You could easily have substituted them for a self-revive minigame and/or put a gun on the drone. Compare that to Quiet or D-Dog. Driving is terrible. Far Cry 3/4 have a more realistic damage model to vehicles ( with FC 4 having a better flight model) and MGS V, Halo, and literally a hundred other games have a better driving model. The gunplay is solid but the cover system is garbage and mantling the environment is buggy and inconsistent. If you're going to have such exquisitely detailed terrain, make it possible to move over, around, and through it. The world and dialogue take itself much to seriously which indicates to me, that it was conceived as a infantry simulator set in a narco state. The plot is pure farce but every character is written so jaded, jagged, and hard-boiled that it creates pure slapstick moments. For instance, in the first mission you have to extract some dude from some hut for some reason that is really quite important. No big deal. See bad men. Shot same. Saw good man. Saved same. And as we're driving off into the sunset, I see my GPS indicate we're three klicks out. I crest a mountain and see that my path is all switchback moutain roads and elevation changes that horseshoes around a valley. I had a moment of clarity in which I realized that my best, fastest way to get there was to drive right off the f*cking ledge of the mountain and hump it across. As I begin to accelerate off, aforementioned good man goes into a campaign speech about tyranny and cocoa leaves. Tyranny and freedom and coke all the way down, folks. So, I drop 500+ feet easy. Flip the car but no damage of which to speak. Not only is the car fine but As I turn around after my character gets out of the car, Mr. Good Man pulls himself out from under the car with no interruption of his scripted speech what-so-ever. The incongruity was hilarious because it felt like, in this modern era of gaming, one of the five people in the car should have at least addressed the fact I apparently had a psychotic episode and tried to kill us all. And this whole antecdote is why open world can go bad. If I didn't know that Mike Zenke and I were going to be doing exactly this sort of stupid sh*t, I would be really pissed I spent $50 bucks on this game. I listened to Giant Bomb go off on Ghost Recon. Then they compared it to Rogue Warrior and Mercenaries 2, at which point I had to be restrained from grabbing my wallet. I really liked Mercenaries 2. We usually frame is as "It was good" versus "I liked it". e.g. : I like the Mario Bros. movie. It is not a good movie. Meh: Things that nobody seems to have a strong opinion on. It thinks it is ARMA but it should have been FC 5 / Mercenaries 3. And don't get me wrong, I will have a blast playing this with the crew but it never should have been called a Ghost Recon game. I wish they'd answer my emails. Awe now, don't be that way. Short and pithy is the key for emails! Great open world discussion, and man there is no way im buying a game console, let alone a Nintendo one, but Breath of the Wild sounds so goddamn appealing. Speaking as someone who has collected every flag and every feather and opened every chest in every Assassin's Creed - even the ones in Unity that required playing the dumb little app game to unlock - yeah, that sounds about right. There is a moment in almost every open world game where I reach a story mission and it starts giving a tutorial on some system or weapon I've been using for 20 hours and I think to myself, either I play these games very wrong or everyone else does. In Horizon it was the ropecaster. In Watch Dogs 2 it was the quadcopter. I'm willing to bet Breath of the Wild will not have one of those moments. I know I'm bananas for it.